Home / Posts Tagged "William Clarke"
The first Ulster casualties of the Great War were sailors on the HMS Amphion, the first ship of the Royal Navy to be lost in the First World War on 6th August 1914. HMS Amphion was an Active-class scout cruiser and the wreck site is designated under the Protection of Military Remains Act 1986. Engine Room Artificer (1st Class) HENRY JOHN BENNETT born at Tor Head in County Antrim, died aged 36. Able Seaman WILLIAM CLARKE born in Moville, County Donegal, died aged 26. 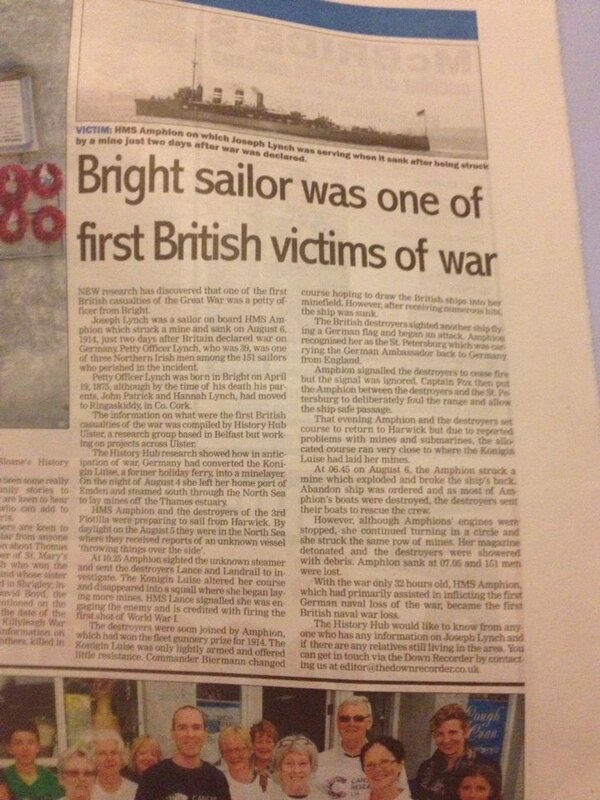 Petty Officer (2nd Class) JOSEPH LYNCH born in Bright, County Down, died aged 39. Able Seaman CHARLES GEORGE McCONACHY born in Belfast, died aged 25. On August 4th 1914, Britain declared war on Germany. In anticipation of war, Germany had converted the Konigin Luisea former holiday ferry into a minelayer. On the night of 4th August she left her home port of Emden and steamed south through the North Sea to lay mines off the Thames Estuary. Meanwhile, HMS Amphion and the destroyers of the 3rd Flotilla were preparing to sail from Harwick. By daylight on the 5th August they were in the North Sea where they received reports of an unknown vessel ‘throwing things over the side’. At 10.25 Amphion sighted the unknown steamer and sent the destroyers Lance and Landrail to investigate. The Konigin Luise alteredher course and disappeared into a squall where she began laying mines. HMS Lance signalled she was engaging the enemy and is credited with firing the first shot of World War I. 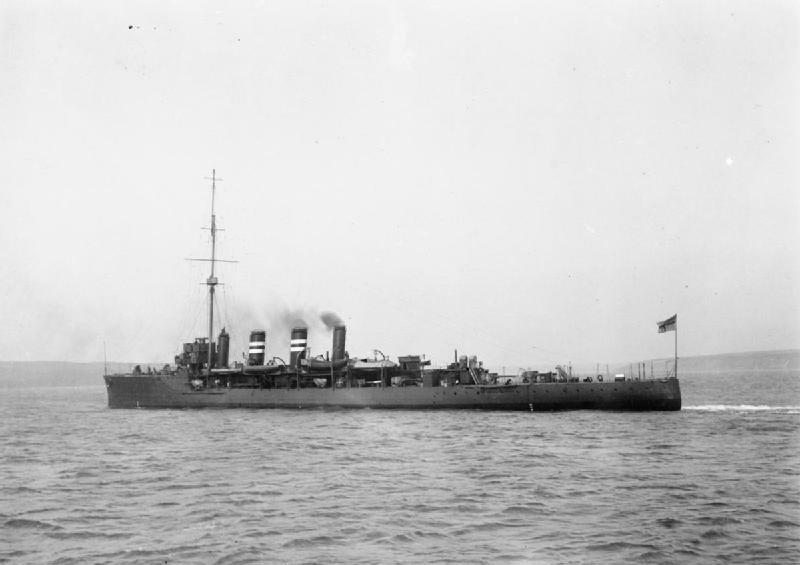 The destroyers were soon joined by Amphion (which had won the fleetgunnery prize for 1914). The Konigin Luise was only lightly armed and offered little resistance. Commander Biermann changed course hoping to draw the British ships into her minefield. However, after receiving numerous hits, the ship was sunk. The British destroyers sighted another ship flying a German flag and began an attack. Amphion recognised her as the St.Petersburg which was carrying the German Ambassador back to Germany from England. Amphion signaled the destroyers to cease fire but the signal was ignored. Captain Fox then put the Amphion between the destroyers and the St. Petersburg to deliberately foul the range and allow the ship safe passage. 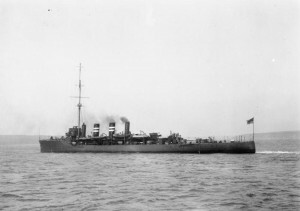 That evening Amphion and the destroyers set course to return to Harwick but due to reported problems with mines and submarines, the allocated course ran very close to where the Konigin Luise had laid her mines. 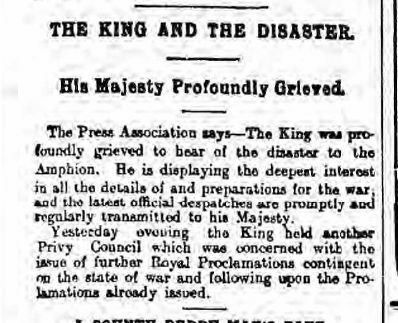 At 06.45 on 6th August, the Amphion struck a mine which exploded and broke the ship’s back.Abandon Ship was ordered. As most of Amphion’s boats were destroyed, the destroyers sent their boats to rescue the crew. However, although Amphions’s engines were stopped, she continued turning in a circle and she struck the same row of mines. Her magazine detonated and the destroyers were showered with debris. 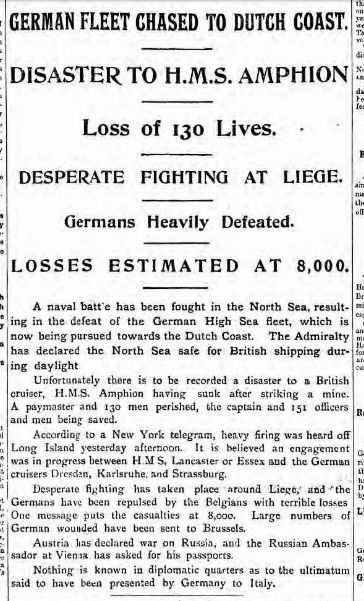 Amphion sank at 07.05 and 151 men were lost. 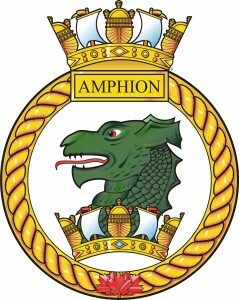 With the war only 32 hours old, HMS Amphion, which had primarily assisted in inflicting the first German Naval loss of the war, became the first British Naval war loss. “3.30pm – at 9am on August 5th, HMS Amphion with the 3rd flotilla proceeded to carry out a certain pre-arranged plan of search and about an hour later a trawler informed them that she had seen a suspicious ship ‘throwing things overboard’ in an indicated position. Shortly afterwards the mine layer Konigen Luise was sighted steering east. Four destroyers gave chase and in about an hour’s time she was rounded up and sunk. After picking up survivors the search continued without incident till 3.30am when the Amphion was on the return course. At 6.30 am Amphion struck a mine. A sheet of flame instantly enveloped the bridge which rendered the Captain insensible and he fell on the fore and aft bridge. As soon as he recovered consciouness he ran to the engine room to stop the engines, which were still going at revolutions for 20 knots. As all the forepart was on fire, it proved impossible to reach the bridge or to flood the fore magazine. The ship’s back appeared to be broken and she was already settling by the bows. All efforts were therefore directed to placing the wounded in a place of safety in case of explosion and towards getting her a tow by the stern. By the time destroyers closed in it was clearly time to abandon ship. The men fell in with composure and 20 minutes after the mine struck, the men, officers and captain left their ship.